But because of all the bad rap that toilet seats get, toilets are the least of our worries when it comes to public restroom germs. Most of the population has learned to wipe down toilet seats before and after use and to cover the seat when flushing so their bacterial concentration is kept to a generally safe minimum. 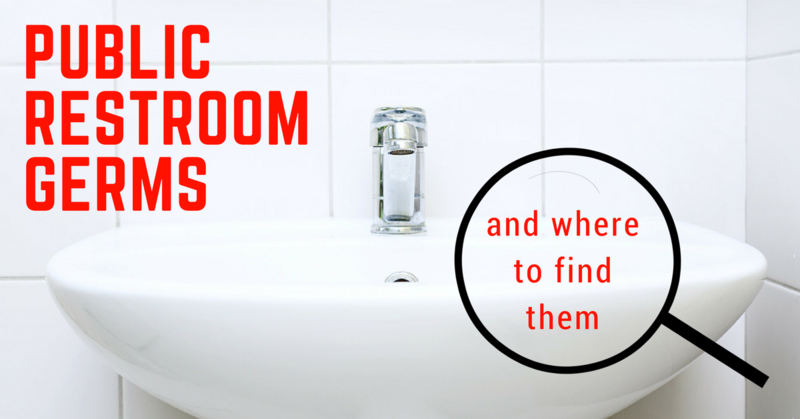 Here are all the other surfaces where you should be watching out for public restroom germs. They are cold. They are often wet, or at the very least damp. And they get a little too close and intimate with the soles of shoes that carry bacteria. This makes restroom floors some of the dirtiest, germiest surfaces in your restrooms, and you may want to think twice about placing your bags on the floor. Perhaps the only thing worse than a cold, wet floor is a cold, wet surface that gets too much love from dirty hands – and that is exactly what sinks are. Public sinks have been found to contain dangerous amounts of live and thriving disease-carrying bacteria, thanks to their generally damp nature and the fact that they’re the first thing that people touch after using the toilet. Be wary of faucet handles and soap dispensers, as well as the touch buttons on non-automatic hand dryers. As a general rule of thumb, anything that gets frequently touched should be counted among the germiest surfaces in a restroom. Germs get spread through hand contact and even when you have been conscientious about washing your hands after using the toilet, the unfortunate truth is that not everyone takes the time to wash their hands thoroughly, if at all. Doorknobs – and not just restroom doorknobs – are favorite sites for bacteria that cause the common cold, swine flu, meningitis, and the calicivirus to name a few. Before touching these offensive little things, make sure to cover them in toilet paper to avoid direct contact. Protect Your Clients and Employees from Public Restroom Germs! Keep your business restrooms clean and germ-free with regular cleaning by stocking up on the right kinds of restrooms supplies. Contact NDC Mats today to take care of your business’ restroom products needs. We have everything to take care of your restrooms – from the floors to the sinks. Get started today!